Assessment of student learning is supported at Neumann University by the Office of the Vice-President for Academic Affairs and the Learning Outcomes Assessment Committee of the Faculty Senate. Educational assessment is faculty-driven. It is also regulated by various higher education accrediting agencies. Assessment practices should be transparent and the evidence of student learning should drive educational practices, program design, and resource allocation. The NU Handbook of Academic Assessment supports the assessment of student learning outcomes at the university. It contains the definitions, processes, forms, and procedures for academic assessment. Using the results of those assessments to improve teaching and learning. This standard on assessment of student learning builds upon Standards 11 (Educational Offerings), 12 (General Education), and 13 (Related Educational Offerings), each of which includes assessment of student learning among its fundamental elements. This standard ties together those assessments into an integrated whole to answer the question, “Are our students learning what we want them to learn?” Self-studies can thus document compliance with Standard 14 by summarizing the assessments of Standards 11 through 13 into conclusions about overall achievement of the institution’s key student learning outcomes. 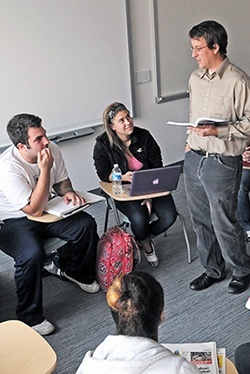 Because student learning is at the heart of the mission of most institutions of higher education, the assessment of student learning is an essential component of the assessment of institutional effectiveness (see Standard 7: Institutional Assessment), which additionally monitors the environment provided for teaching and learning and the achievement of other aspects of the institution’s mission, vision, and strategic goals and plans.